The Holy Martyrs Vitus, Modestus, and Crescentia the Nursemaid, suffered for Christ during the reign of emperor Diocletian (284-305). The holy Martyr Vitus was son of an illustrious Sicilian dignitary, the pagan Gelas. While still a young lad, Saint Vitus was enflamed with an ardent love for the Lord Jesus Christ and he prayed incessantly to Him. The Lord gave him the grace of wonderworking. He healed the sick and converted many pagans to Christ. Learning about this, the governor Valerian summoned Gelas and advised him to turn his son away from faith in Christ; and how that were the emperor at some time to issue an edict for the persecution of Christians, not only the lad, but all the household of Gelas would suffer. But Gelas was not able to persuade Saint Vitus and he began to beat the lad. The governor Valerian learned that Saint Vitus had refused to offer sacrifice to the gods, and summoned him to trial before him. The holy lad firmly confessed his faith before the court and unconditionally refused to offer sacrifice to idols. They beat him again. When the governor, giving the signal for increasing the torture, lifted his hand, it immediately withered. The governor received healing through the prayer of the saint and, dissolving the trial, he gave back the holy lad to Gelas, having commanded that he not turn him away from faith in Christ. In order to corrupt his son in fleshly sin, Gelas surrounded him in luxury, and brought pretty girls to him. They filled him with tasty food, arranged banquets and entertainment, but the expected results were not forthcoming. Saint Vitus did not cease to pray, and he asked God’s help in temptations. Angels appeared to him and prayed with him. When Gelas went took his son and glanced at the Angels, he immediately went blind. Gelas gave a vow to recant from idols, and Saint Vitus healed him. But, stubborn of heart, Gelas did not keep his vow. Paternal love for his son turned to hatred for him, and he decided to kill him. In order to save the boy, his tutor Saint Modestus and his nurse Saint Crescentia – who were Christians, secretly took him from his parental home. At the river they saw a boat. An Angel went into the boat together with them and they reached the Italian district of Lucanium, where the saints lived quietly – hidden away from torturers. The holy lad never ceased to heal the sick and he converted pagans to Christianity. Here also news about him spread about. Saints Vitus and Modestus went to present themselves before Diocletian. Taken with the fine appearance of the lad, he at first urged him to offer sacrifice to idols. The holy lad denounced senseless idol-worship and he healed a demoniac son of Diocletian. The emperor offered Saint Vitus great honours, fame and riches – on the condition that he recant from the Christian faith. The lad refused and with his former courage he confessed himself a Christian. They locked him up in prison together with Saint Modestus. When Jesus Christ appeared to the prisoners – strengthening them in their deed and giving His help, the fetters fell from their hands. Ascribing the miracle to magic, Diocletian gave command to throw Saint Vitus into a cauldron of boiling oil. The saint stood in it, as though in cool water, and remained unharmed. Then a fierce lion was set loose at him. The lad signed himself with the sign of the cross, and the beast peacefully lied down at his feet and began to lick his foot. They hung the holy martyrs on pillars and began to rip at them with iron claws. Saint Crescentia came out of the crowd of spectators, confessed herself a Christian and reproached the emperor for his cruelty. He sentenced her also to torture. Saint Vitus called out to God: “O God, save us by Thy power and deliver us”. An earthquake started. Many pagans perished under the collapsed buildings, and Diocletian in fear fled to his chambers. An Angel released the martyrs from the pillars and took them to Lucanium. The holy Martyr Vitus prayed to God, that He would accept their souls in peace and not deprive His benefaction from all, who would keep their memory. From Heaven came a Voice: “Thy prayer is heard”. The saints with joy gave up their souls to God. 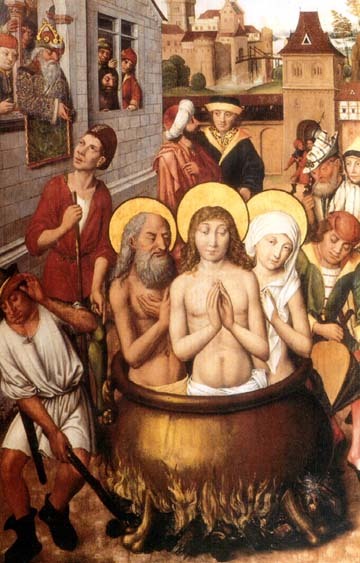 The sufferings of the holy Martyrs Vitus, Modestus and Crescentia occurred in about the year 303. The memory of these saints is celebrated also on 16 May. The relics of Saint Vitus were transferred to Prague (Praha). Holy Nobleborn prince Vyacheslav of the Czechs (Comm. 28 September) constructed a temple in honour of the holy Martyr Vitus, in which he was afterwards buried. Grant O Lord, we pray, that through the intercession of thy Holy Martyrs Vitus, Modestus and Crescentia, thy Church be not high-minded, bu grow in that humility which is pleasing to thee, so that despising evil, she may practice whatever is good with unbounded charity. Through our Lord Jesus Christ, Thy Son, Who livest and reignest with Thee in the unity of the Holy Ghost, one God Forever and ever. R. Amen. Lesson from the Book of Wisdom: But the souls of the righteous are in the hand of God, and there shall no torment touch them. In the sight of the unwise they seemed to die: and their departure is taken for misery, And their going from us to be utter destruction: but they are in peace. For though they be punished in the sight of men, yet is their hope full of immortality. And having been a little chastised, they shall be greatly rewarded: for God proved them, and found them worthy for himself. As gold in the furnace hath he tried them, and received them as a burnt offering. And in the time of their visitation they shall shine, and run to and fro like sparks among the stubble. They shall judge the nations, and have dominion over the people, and their Lord shall reign for ever. In triumph let thy faithful servants rejoice, rejoice and take their rest. V. Sing the Lord a new song; here, where the faithful gather, let his praise be heard. Alleluia, alleluia. V. Ps. 144:10-11 Let thy faithful servants bless thee, O Lord; let them publish the glory of thy kingdom. Alleluia! He that heareth you, heareth me; and he that despiseth you, despiseth me; and he that despiseth me, despiseth him that sent me. And the seventy-two returned with joy, saying: Lord, the devils also are subject to us in thy name. And he said to them: I saw Satan like lightening falling from heaven. Behold, I have given you power to tread upon serpents and scorpions, and upon all the power of the enemy: and nothing shall hurt you. But yet rejoice not in this, that spirits are subject unto you; but rejoice in this, that your names are written in heaven. How wonderful God is in his saints! The God of Israel give his people strength and courage, blessed be God! As the gifts, we offer in honor of thy Saints, O Lord, bear witness to the glory of thy divine power; so may they win for us the benefits of thy salvation. Through Jesus Christ, thy Son our Lord, Who liveth and reigneth with thee, in the unity of the Holy Ghost, ever one God, world without end. R. Amen. The souls of the just are in God’s hands, beyond the reach of their tormentor’s malice. Fools account them dead, but all is well with them. We, who have been filled with thy solemn blessing, ask, O Lord, that, through the intercession of thy holy Martyrs Vitus, Modestus and Crescentia, this healing sacrament may benefit both our bodies and our souls. Through Jesus Christ, thy Son our Lord, Who liveth and reigneth with thee, in the unity of the Holy Ghost, ever one God, world without end. R. Amen.